Walk-thru design is either self-catching or manually operated. Yokes and gate frames 2" diameter pipe. 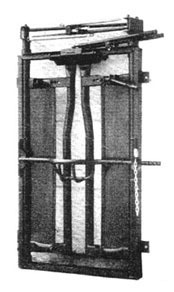 Rugged channel main frame. All welded construction. 1" diameter pipe handles and nose catch standard. 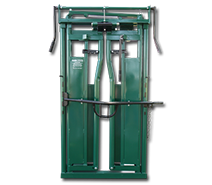 Head Gate yoke width is adjustable. Weight 270 lbs. Freudenthal Self Locking Panels are available in any length and we will put in as many openings as room allows, unless otherwise specified. All Panels are priced by the foot.